ELECTED IN A HISTORIC LANDSLIDE! In 1920, post-World-War-I America has grown tired of Woodrow Wilson's Globalism, high taxes, and creeping socialism. Pledging a “return to normalcy,” Senator Warren Harding (R-OH) is elected President. 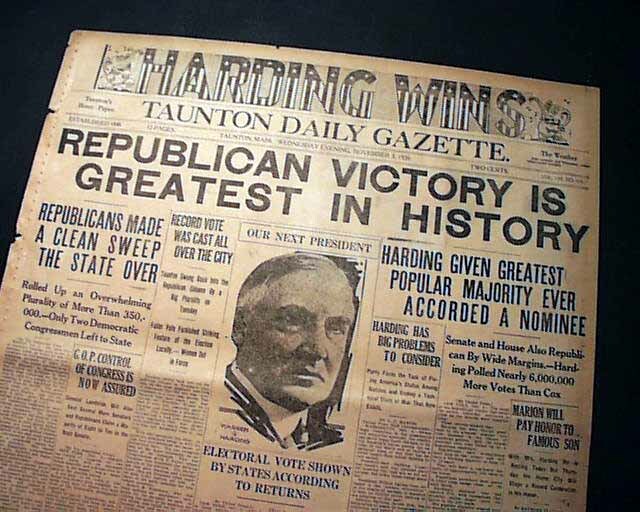 An opponent of entry into the League of Nations, Harding's victory over liberal Democrat James Cox (D-OH) and his running mate Franklin D Roosevelt, is the largest Presidential Election landslide in America's history (60% - 34%)! 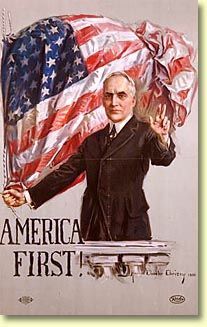 Harding's inaugural address rejected Globalism. "The recorded progress of our Republic, materially and spiritually, proves the wisdom of the inherited policy of noninvolvement in Old World affairs. Confident of our ability to work out our own destiny, and jealously guarding our right to do so, we seek no part in directing the destinies of the Old World. We do not mean to be entangled. We will accept no responsibility except as our own conscience and judgment in each instance may determine. We sense the call of the human heart for fellowship, fraternity, and cooperation. We crave friendship and harbor no hate. But America, our America, the America built on the foundation laid by the inspired fathers, can be a party to no permanent military alliance. It can enter into no political commitments, nor assume any economic obligations which will subject our decisions to any other than our own authority." Then as now, no term is more reviled and mocked by the Globalists than "America First." Globalist owned "Yellow Press" discovered "scandals" on Harding. Harding's support for free markets, limited government, low taxes, neutral foreign policy, and his refusal to grant diplomatic recognition to Lenin's murderous Soviet Union, are all positions that anger the Globalists. An intense newspaper smear campaign regarding an "oil scandal" involving members of Harding's administration is then unleashed against the highly popular President. "The Tea Pot Dome" Scandal got its name from Harding correctly dismissing it as a "tempest in a teapot". Elements of the Eastern Globalist Press are unrelenting in their breathless attacks upon Harding. But the American public isn't buying the propaganda. Harding, and his policies, remain popular. 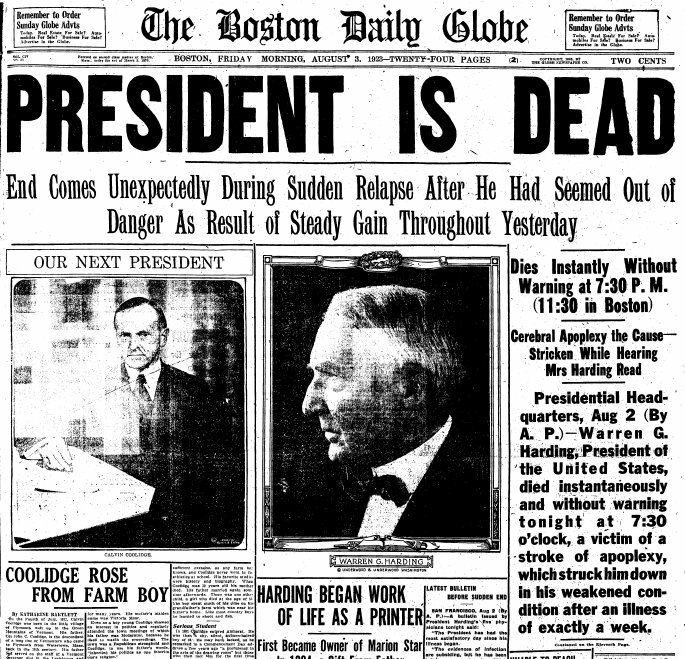 In 1922, while recovering from a strange sickness that had stricken him in San Francisco, President Harding shudders and dies suddenly during the middle of conversation with his wife. Doctor's cannot agree on the cause of his strange death. Within an hour of his demise, Harding's body is embalmed and placed in a casket. The following morning, the body is on a train, headed back to Washington Incredibly, no autopsy is performed! The suspicion ("conspiracy theory") of a deliberate poisoning rages throughout America. Millions of Americans lined the railway route to pay respects to their beloved President. 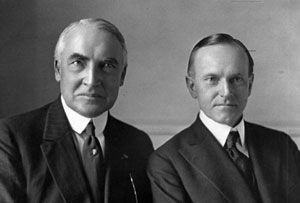 The sudden death of the immensely popular 57-year-old statesman, who successfully reversed most of Wilson’s damage in only 29 months, remains a mystery to this day.NNot much is known about how Harding's soft-spoken successor (Vice President Calvin Coolidge) will govern. 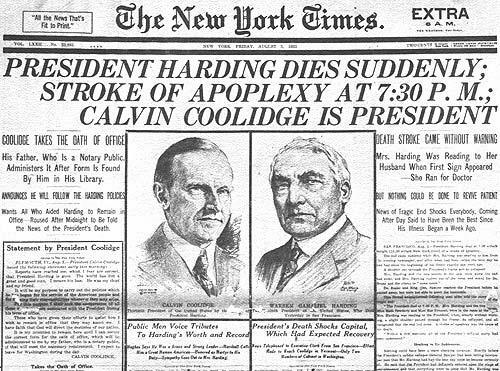 It soon becomes apparent that Coolidge's tenure (1923-1928) will be just as pro freedom as Harding's. The Globalists and their wholly owned Federal Reserve Bank printing press will have to wait until 1929 to deliberately crash the economy under Hoover, and then install FDR in 1932. Hatin' on Harding. It never ends! "Tea Pot Dome" : Pure crap - while Wilson's and FDR's treasonous crimes are ignored. Harding inherits a severe Wilsonian economic Depression. He quickly moves to dramatically slash income taxes and government spending (both by 50%!). Harding undoes Wilson's damage, proclaims American neutrality, and returns the country to the limited government days of Wilson's predecessor, William Howard Taft (who he names as Chief Justice of the Supreme Court). With the private economy now freed from the parasitic dead weight of big government, an historic economic boom soon follows. The "Roaring Twenties" will be a period of prosperity and happiness for the American people. And boy-oh-boy are the Globo-Zio-Socialists pissed off!